Throughout a normal day, your business may come under attack from a wide range of different factors. From germs and bacteria on the handles to wear and tear on the faucets, every structure absorbs differing degrees of damage on a daily basis. One area that can quickly hurt your building’s aesthetic value is the damage incurred to your drywall. It is important to keep your walls, floors, and windows looking their best at all times. Failing to do so may hurt the morale of your employees and negatively impact first impressions guests have upon visiting your establishment. If your walls have become noticeably scuffed and damaged, it may be time to find a local drywall company in Illinois that can address all of your building’s needs. AZ Drywall Finishing is proud to be your team of drywall contractors in Chicago that can handle all of your wallboard needs from start to finish. Our commercial drywall company has been installing drywall across the state since 1999, delivering quality results that are made to exceed your expectations. While our drywall finishers can assess your company’s needs for a quality outcome, we cannot protect your interior walls from daily interactions. 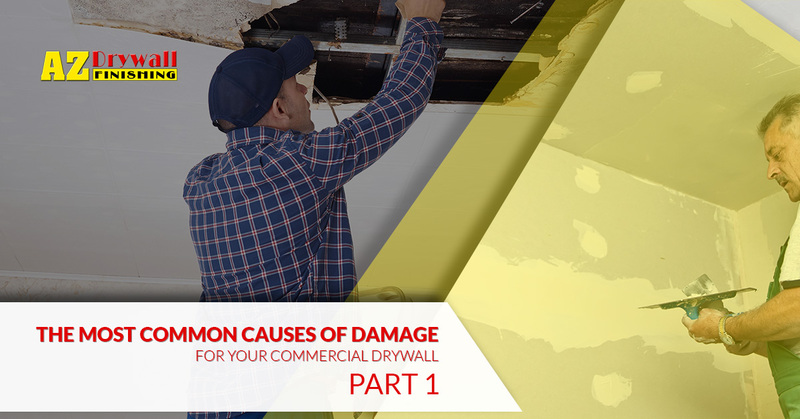 Today, we’ll highlight a few of the most common causes to your commercial or industrial drywall, as well as some tips that may prove useful in the future. If you are currently looking for a local company that can handle your acoustic ceiling, metal stud framing, and drywall installation needs, be sure to reach out to the AZ team for assistance! We might as well start with one of the most prevalent occurrences in office buildings across the country. Scuff marks commonly result from furniture colliding with your walls. Lobbies, break rooms, and common areas all are frequent victims of this unsightly problem. While impressively common, your building should still be in good shape. Your gypsum board is able to withstand minor impacts, and small collisions that have not damaged the drywall can typically be washed away for a noticeable aesthetic improvement. If you notice areas in your facility that are marred with scuff marks, it may help to organize the room in such a way that minimizes the chances of furniture getting too close to the walls. While this may not sound like a major improvement, the long-term benefits of saving your furniture and your drywall from damages can add up. If your drywall is not securely fastened with nails, movement over time can eventually cause the nails to back out, leaving unsightly marks and compromising the wallboard section in question. In many residential and commercial drywall scenarios, individuals will simply drive the nails back in via hammer. This action typically results in more wear and tear on the entry point, increasing the chances the nail will back out again and possibly causing further damage to the surrounding drywall. Our professional drywall contractors have the experience and skill to offer cost-effective and long-lasting solutions for your Chicago business. In this case, we would recommend removing the nails, patching the holes, finding the studs, and securing the board correctly to avoid any future problems. If your building is in need improvements, our drywall finishers will create an outcome to match your facility’s needs and budget. While H2O is a necessary part of our very existence, it can create havoc when introduced into your building’s drywall. A leaky water line, for example, can spell disaster for any commercial facility. The first step is to stop the leak via professional services. Once the moisture is under control, it is essential to find a commercial drywall company for assistance with repairs. When subjected to high levels of water, drywall can become saturated and fail to hold up structurally. This occurrence results in a terrible visual outcome for your building, with sagging, dropping walls. Beyond aesthetic problems and structural concerns, moisture can also result in mold growth within your drywall. When left unchecked, this scenario can result in a wide range of problems for your building’s employees and guests. From flu-like symptoms to higher cancer rates, mold is a serious concern that must be dealt with ASAP for the best results. Regular facility maintenance is an important part of ensuring that your facility’s plumbing is up to the task of moving water in and waste out. Annual inspections are a big part of building safety. If your building is afflicted with mold problems, aggressive countermeasures should be in place to ensure that mold growth does not continue. From the furniture marks in your lobby to the dripping water leak beneath the faucet, your walls are subjected to dangers on a daily basis. Next time, we’ll continue this topic by discussing other problems that can create serious problems for the looks of your business. If your building is in need of a facelift, AZ Drywall Finishing is here to help. For years, our drywall contractors in Chicago have worked to provide the best outcomes for every commercial client we work with. Contact us today to learn more or to receive your free estimate!